AstroDance dancers use stretch bands to represent the gravitational waves from supernovae. Sai Pathmanathan is a science education consultant in the United Kingdom. She contributed this article to Live Science's Expert Voices: Op-Ed & Insights. Bringing astrophysics to the masses is difficult at the best of times, but how do you communicate such complex science to students in underserved groups, such as those who are deaf or hard-of-hearing? One research team has developed a unique approach: Use dance and stunning backdrops to teach the mathematics and physics of merging black holes. Manuela Campanelli, is director of the Center for Computational Relativity and Gravitation (CCRG) at the Rochester Institute of Technology (RIT) where she and her colleagues study how black holes merge. Through a grant from the U.S. National Science Foundation (NSF), Campanelli and her team have built an astrophysics and dance public engagement program, AstroDance, around their original research and a smaller, but popular, demonstration they presented during the Light in Winter Festival in Ithaca, N.Y. The AstroDance dancers' movements represent the birth and evolution of the universe. This relates to recent discoveries that are bringing society closer to understanding what happened soon after the Big Bang. In their research, Campanelli and her team use computer simulations to study the merging of super massive black holes. Such studies require processing several petabytes (one thousand million million bytes — 1,000,000,000,000,000 bytes) of information at once, a technical threshold that scientists once thought unobtainable, or at least many years away. However, thanks to the super computers NewHorizons, BlueSky, Stampede and Blue Waters, the RIT team is able to calculate theoretical simulations of black hole mergers where the masses of the merging black holes can vary by powers of ten. This will help researchers better understand the role of black hole mergers and related events within the universe, and what this could mean for the future of galaxies, like our own galaxy, the Milky-Way. The question of how to communicate the research became obvious to Campanelli and her team: Since such science is about material bodies, gravitational pull and motion, why not use the grace of dance and spectacular imagery to captivate audiences? Dance, like black holes, is about time and space, and provides a universal language to help represent complex concepts. Visuals and nonverbal, aesthetic, emotional experiences are important when engaging the deaf and hard-of-hearing, but yet are appealing to all, offering a different perspective to the communication and understanding of astrophysics research. Using hoops, AstroDance dancers present an abstract representation of Black Holes merging. Through AstroDance, performers reveal the nature of black holes, where time and space end, and from which nothing, not even light, can escape. Black holes convey tremendous visual depth, warping spacetime with their massand sending gravitational waves — ripples in spacetime — across the universe. Over the next year, the AstroDance team will combine video clips of their live performanceswith scientist and artist interviews to produce a short educationaldocumentary film for further dissemination to the general public. The project will also gather data to evaluate the impact of dance on engaging audiences with STEM (science, technology, engineering and math) content. 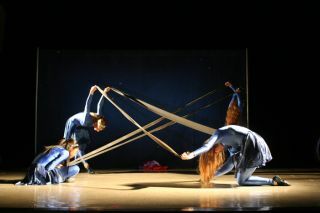 A visual representation of space-time and other astrophysical concepts expressed by AstroDance dancers. Dancing about complex science and astronomy themes is not new. Dance Your PhD is a competition designed to get early stage scientists communicating their research to the general public through dance and music, and Bethany Cobb, an NSF-funded postdoctoral fellow, brings awareness of the cosmos to the wider population through The Star Dances. What makes AstroDance so innovative is that as a theatrical, dance and multimedia performance, it tells the story of the search for gravitational waves, presents public engagement alongside striking visualizations of black holes, and is genuinely for everyone: deaf, hard-of-hearing and hearing audiences. A group photo of the AstroDance team showing the key vocabulary used throughout the show. For more about AstroDance at the Rochester Institute of Technology. Author's note: Dr. Campanelli would like to thank the whole team for the project's success: Antonietta Alfanso, Ashley Gast, Nicole Hood, Andrea Mariani, Leen Massillon, Carlos Valentin (dancers), Joseph Fox (narrator), Erin Auble, Hans-Peter Bischof, Joe Bochner, Jake Noel-Storr, Jason Nordhaus, Thomas Warfield and Yosef Zlochower (Rochester Institute of Technology).